A nice paper that should serve as a cautionary tale against generalizing genotype-phenotype interactions discovered into some populations into new ones. The reason for this is simple: the known LP-related genotypes may be nullified/enhanced/otherwise affected by the general genomic background of the individual. While they do act -to a large extent, that's why they were discovered!- as on/off switches of lactase persistence in certain human populations, they do not do so generally across much of mankind. While these results indicate (e.g. for clinicians) that an assessment of lactase peristence from genotype is iffy for certain contemporary human populations, they also cast doubt into certain archaeological correlations of lactase persistence. Using both contemporary genotype frequencies, the few but increasing ancient DNA genotypes, as well as archaeological remains (e.g., milk residues in bowls), scientists are trying to determine when and how lactase persistence spread. But, this becomes more difficult, both because (a) the LP genotype can't really tell us whether a particular individual was LP or not - and hence lived in a heavily milk-reliant culture, and (b) we do not really know how LP interacted with the genomic backgrounds of individuals living during the Neolithic. The ability of adult humans to digest the milk sugar lactose - lactase persistence - is a dominant Mendelian trait that has been a subject of extensive genetic, medical and evolutionary research. 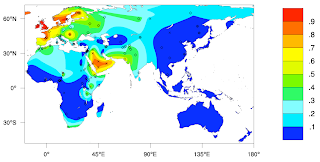 Lactase persistence is common in people of European ancestry as well as some African, Middle Eastern and Southern Asian groups, but is rare or absent elsewhere in the world. The recent identification of independent nucleotide changes that are strongly associated with lactase persistence in different populations worldwide has led to the possibility of genetic tests for the trait. However, it is highly unlikely that all lactase persistence-associated variants are known. Using an extensive database of lactase persistence phenotype frequencies, together with information on how those data were collected and data on the frequencies of lactase persistence variants, we present a global summary of the extent to which current genetic knowledge can explain lactase persistence phenotype frequency. We used surface interpolation of Old World lactase persistence genotype and phenotype frequency estimates obtained from all available literature and perform a comparison between predicted and observed trait frequencies in continuous space. By accommodating additional data on sample numbers and known false negative and false positive rates for the various lactase persistence phenotype tests (blood glucose and breath hydrogen), we also apply a Monte Carlo method to estimate the probability that known lactase persistence-associated allele frequencies can explain observed trait frequencies in different regions. 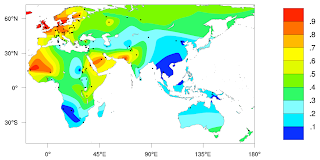 Lactase persistence genotype data is currently insufficient to explain lactase persistence phenotype frequency in much of western and southern Africa, southeastern Europe, the Middle East and parts of central and southern Asia. We suggest that further studies of genetic variation in these regions should reveal additional nucleotide variants that are associated with lactase persistence. Just what I've been saying. Seems clear to me that at least one mutation for LP hasn't been discovered yet. I'd guess at least two mutations. One expanding out from Dakar, Senegal more or less (not clear if this would be a Nilo-Saharan remant or a proto-Bantu source), and the other probably traceable to the ancient Indus River Valley civilization from around the time of the Neolithic Revolution and expanding out from there across Asia. It would be surprising if the LP hot spots in both places had common origins. Hmm. Very interesting from an ancient migration pattern perspective. Is the North African LP frequency pattern indicative of a pincer movement (from Spain and Arabia) or an ancient migration from the east across North Africa to Morocco? Larry David less Caucasoid than Jessica Alba?